Home / Uncategorized / SPONSORS NEEDED! And now you can help, from anywhere in the U.S!! 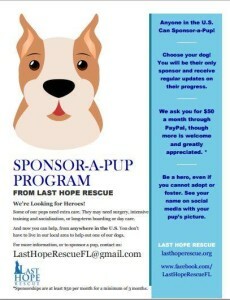 You don’t have to live in our local area to help out one of our dogs. Our goal is to have a sponsor for a few of our dogs that are a little more high maintanence, care-wise (and we love them even more for it!) wink emoticon Sponsorships are at least $50 per month for a minimum of 3 months. All payments are to be made via Paypal. We hope you will consider becoming a hero today, by sponsoring one of the pups in this album! !